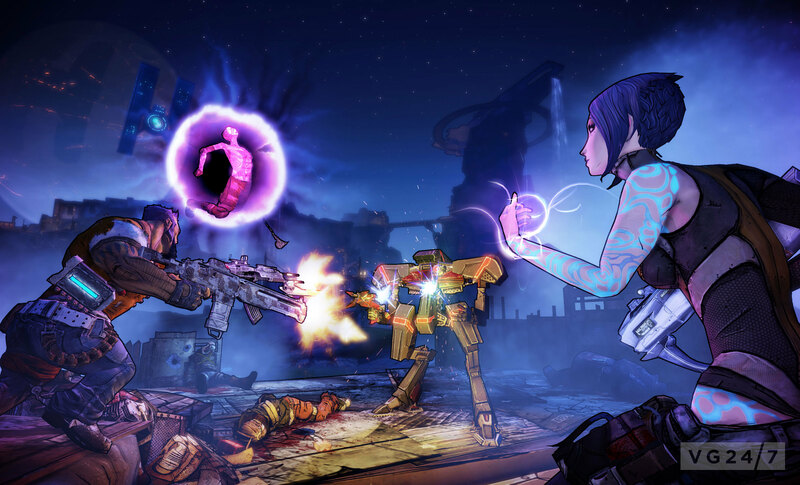 Here you have seven minutes of new Borderlands 2 gameplay in HD, a hands-on with multiplayer and a chat with Gearbox about quirky visuals and RoboCop. Ever seen a siren in action? Here’s your chance. 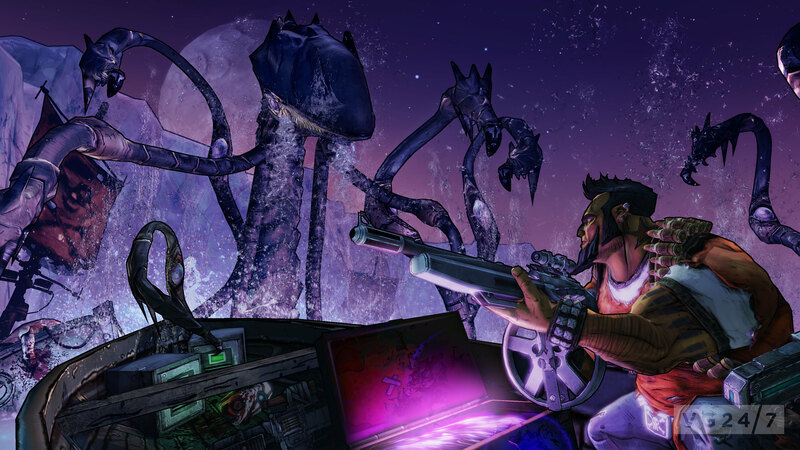 Features online and split-screen drop-in co-op. Mission structure has been overhauled to eliminate the original game’s mandatory “checking-in” of missions, reducing back-tracking. 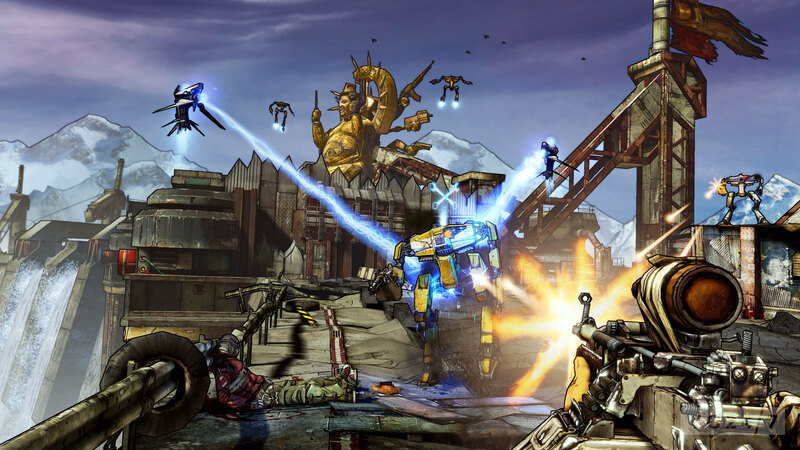 The ineligibility problem of Borderlands multiplayer that meant players that had completed missions couldn’t play co-op with those that hadn’t, has been fixed. Now, players further along in the story can reset their mission status to enable them to hook up with friends that are lagging behind. 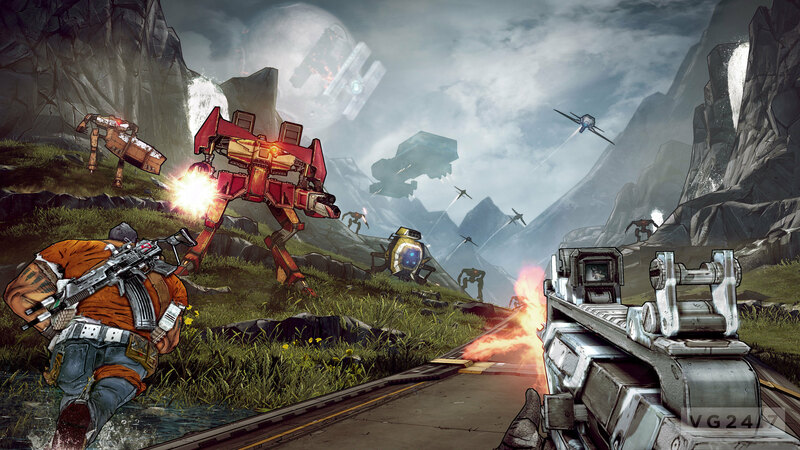 Gearbox describes Borderlands as one of the most successful new IPs of this console generation, having sold over 4m of the original game. 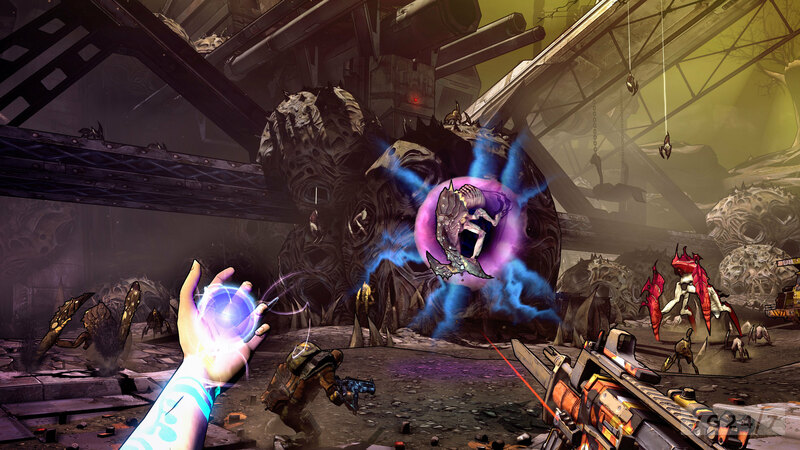 Gearbox Easter Egg: Whilst acknowledging the difficulty of taking on development of last year’s Duke Nukem Forever part way through its gestation, a Gearbox rep suggested that the team are now in a position to make any future games in the series “much more our own”. Watch this space. 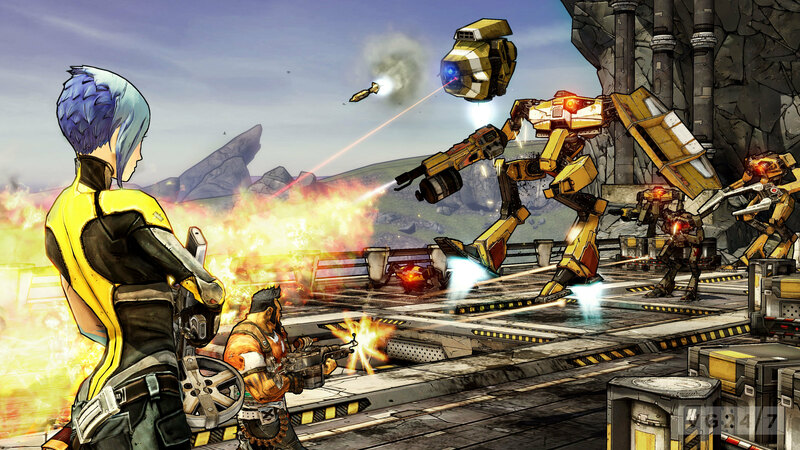 It’s a curio of game design that, for much its development, Borderlands looked nothing like Borderlands. 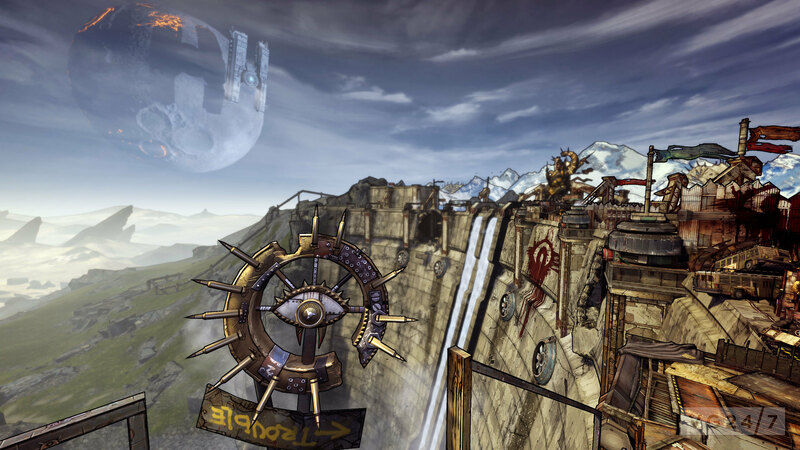 As the story goes, a handful artists and coders were at a loose end a couple of years into the development of Gearbox’s new IP and so took it upon themselves to prototype an entirely different visual style for the multi-million-pound project; one that moved away from the photo-real and toward the realm of comic-books. 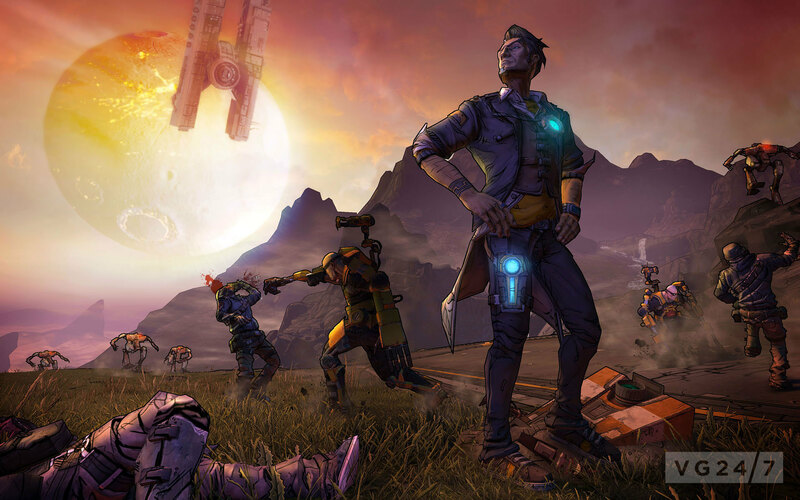 The results speak for themselves and the fact that Borderlands is recognisable from almost any screenshot is a testament to this experimentation and creative vision. 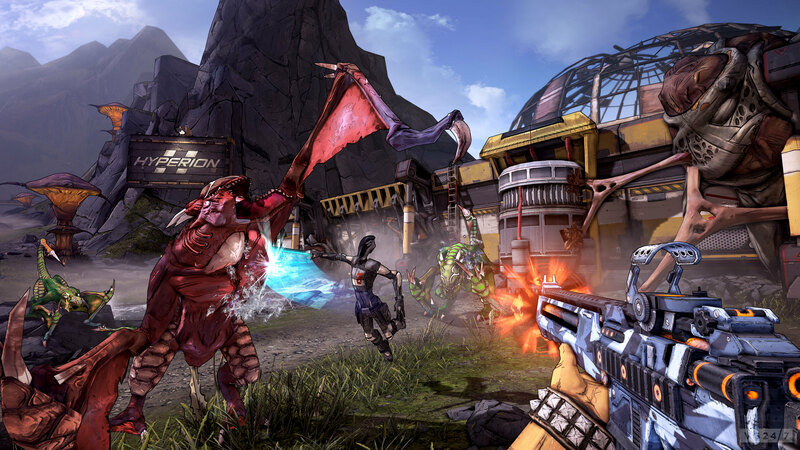 It’s also to the credit of both Gearbox and 2K that so fundamental a change, made so late in development, was embraced wholeheartedly. But if there’s one disappointment that arose from this eleventh-hour change of visual identity it’s that there was little time for the new art style to do much to inform game design. Whilst a few incidental flourishes appear here and there, it’s very easy to imagine a Borderlands whose vaults, caverns and rocky outcrops look photo-real. 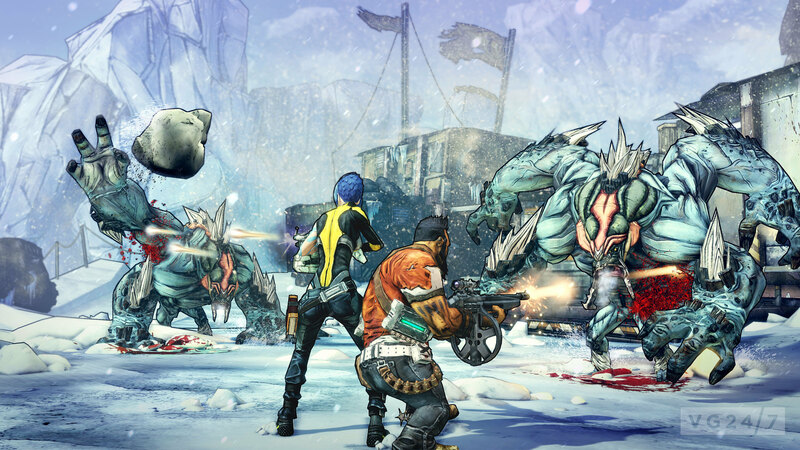 However, with the distinct art style already in place this time around, Gearbox has been able to pick and choose how it incorporates it into every facet of Borderlands 2. 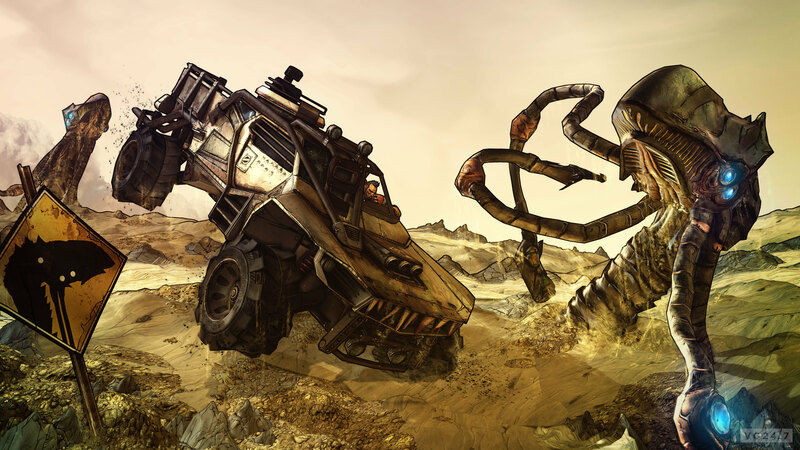 Game and level designers have been in sync with concept and environmental artists from the off, resulting in a marriage of the exaggerated art style with more outlandish environments and offbeat character design. 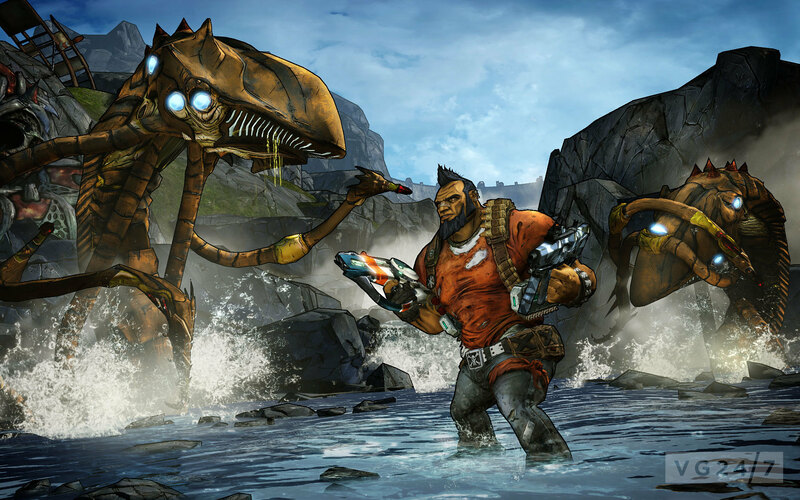 “We wanted to keep that original art style and examine it to find out why it was successful,” explains Kevin Duc, lead concept artist at Gearbox Software. “We found this neat connection between the photo-real and comic-book-style cel-shaded which comes from keeping the inks loose but maintaining the grit of photorealism underneath. 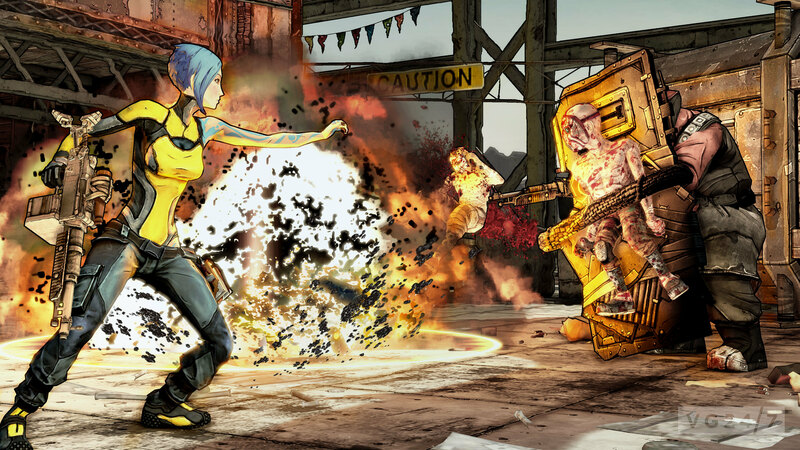 “With loose art comes a vitality that allows story to be more free and level design to become a little more extreme. There’s a nice back and forth that develops with [the art team] expressing the ideas that [the story writers] have created and realising the crazy and dark characters. 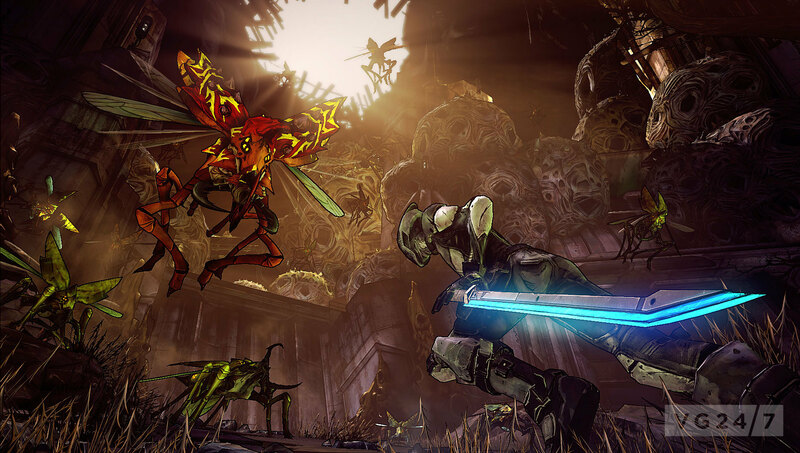 Certainly, it would difficult to imagine a mid-level boss with a midget strapped to his shield being portrayed as anything other than darkly comic and, therefore, in any way other than with Borderlands comic-style visuals. 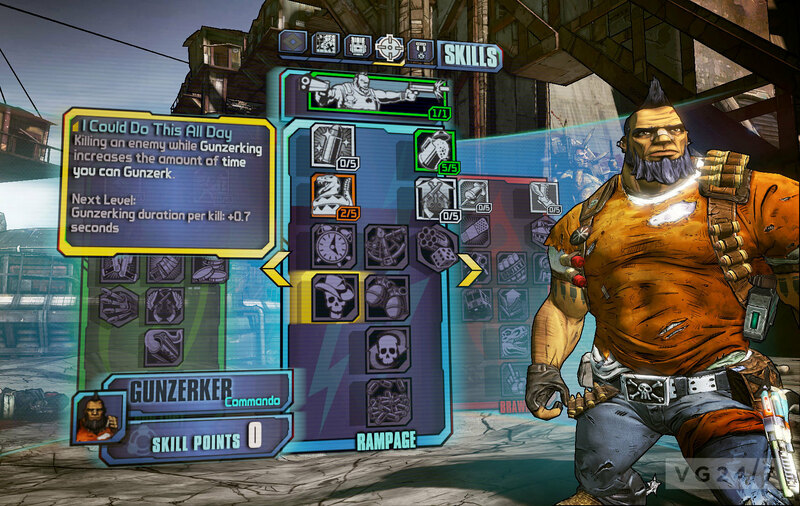 The exaggerated visuals also play a major part in the design of the multitude of guns and loot; while Borderlands primary reward system was based on the collection of new weapons, it was often necessary to compare and contrast every weapon-drop with those in your inventory to ascertain whether it was worth collecting. Now, each weapon manufacturer has more distinct gameplay properties, such as those that explode when thrown or that are less powerful but far more likely to inflict status effects. The more clearly defined visual personality of these weapons allows for at-a-glace identification of their manufacturer, which in-turn enables you to determine whether it’s a class of weapon that suits your play style. “When we created the Bandit-class we wanted to make it look like it’d been assembled up in the hills, all sharp edges and quarter-inch steel,” illustrates Duc. “With Torgue, a big beefy American 1980’s style manufacturer, we looked not just at guns of that time period for inspiration, but at other sources too, like motorcycles and chunky engine blocks. 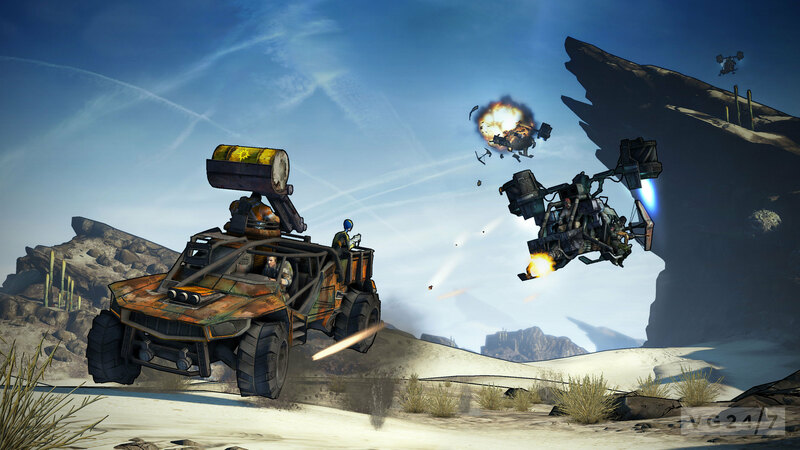 The result is a set of weapons that follow real-world brand identity principles with the exaggerated and entertaining attributes expected of Borderlands. Personal preference of weapons combined with varied skill trees allows for some flexible class-customisation, as illustrated by our multiplayer session. A foray into a very wild, wildlife reserve begins me and my co-op partner allocating 20 skill points to customise our characters and despite both choosing to play as the Siren class, it results in two very different character builds. One is more support-based, with a nifty ability that converts the typically negative effect of friendly fire into positive healing, while the other has a more a powerful phaselock – the Siren’s new, combat orientated class power – that inflicts status effects in addition to freezing the enemy in place. 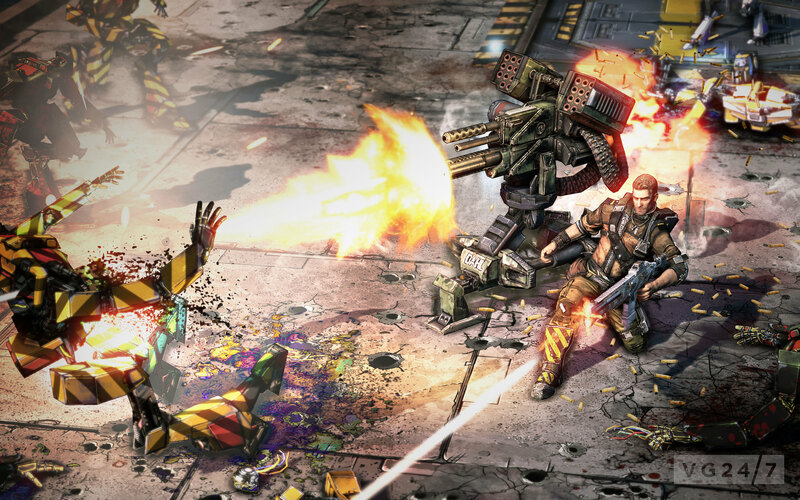 What follows is an entertaining co-op experience, but one that is not without niggles; the most fundamental of which is check-pointing, which is a concept that developers should have well and truly licked by this point. 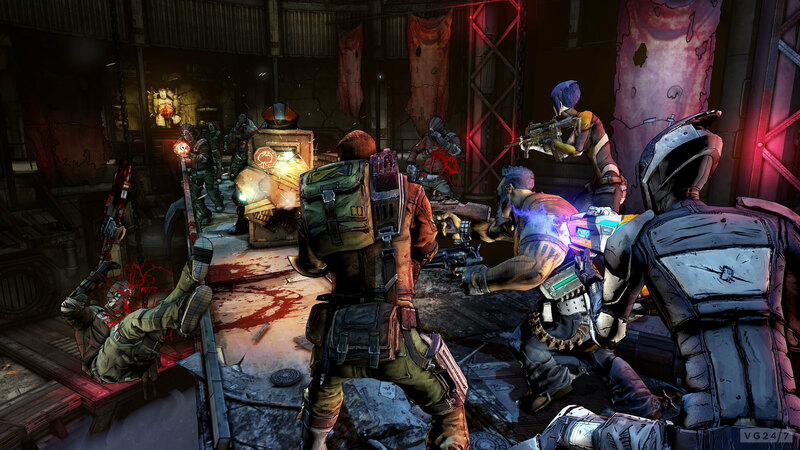 Being granted a second wind for killing any enemy while bleeding-out is useful, as is the ability to revive a teammate, but when swarmed by assailants in an arena-style environment or facing a mid-level boss, these options become less viable – especially if playing with fewer than three teammates. Unfortunately, the checkpoint spacing then necessitates a long jog back to rejoin the fight – during which time your partner may also have been killed – which becomes tiresome. A greater emphasis on co-op objectives would also be welcome; certainly the section that we played featured little that needed to be achieved as a team and so it became two, single players inhabiting the same space, rather than genuinely co-operating. 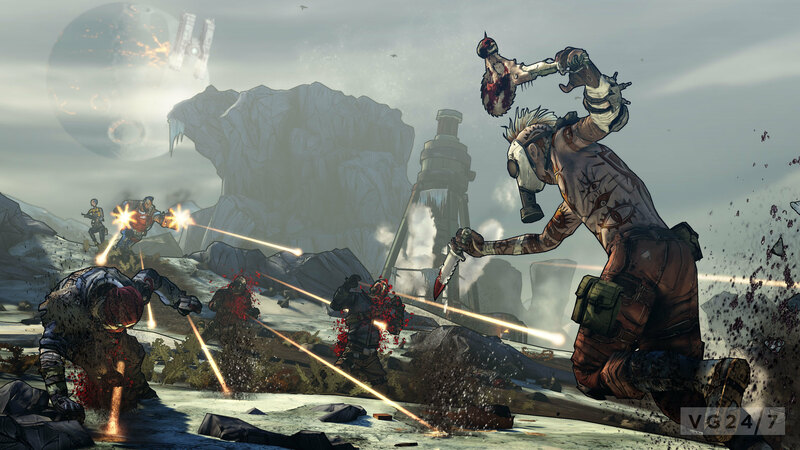 However, there’s over five months until the game’s launch which is plenty of time for minor check-pointing niggles to be addressed and for Gearbox to ensure that Borderlands 2 is as arresting to play as it is to ogle. 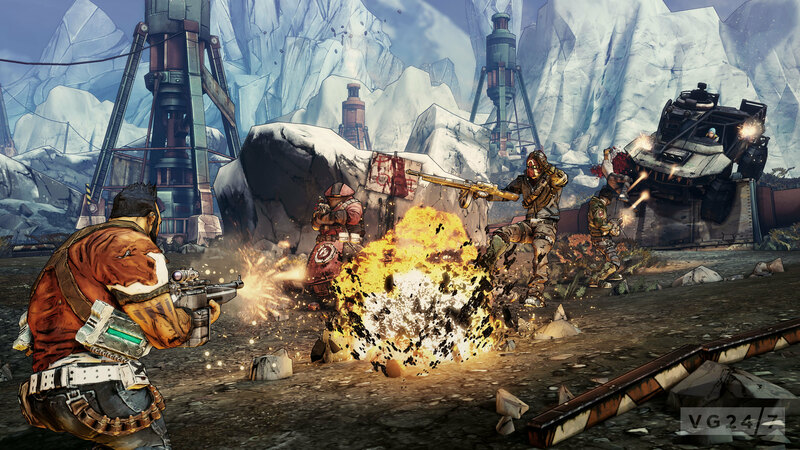 Borderlands 2 launches on PC, 360 and PS3 on September 18 in the US and September 21 in PAL territories.